The Packers didn’t pick up the win, but Rodgers was fantastic in the loss to the Seahawks on Thursday Night Football. On throws 20-plus yards downfield, Rodgers went four-for-six for 176 yards and two touchdowns, the most and tied most, respectively, among quarterbacks in the NFL this week. The surprise story of the week was the emergence of undrafted rookie Gus Edwards in the Baltimore backfield. His 6.8 yards per carry, and 5.4 yards after contact per carry, were the most of any running back in the NFL with at least 10 carries this week, and he forced eight missed tackles on just 17 carries. In a breakout game, Smith delivered for Drew Brees and the Saints’ offense. Eight of his 10 receptions resulted in a touchdown or first down. With 157 yards from 30 snaps as a receiver, Smith ranked second among all wide receivers in the NFL this week with an average of 5.23 yards per route run. Hilton led all wide receivers with an average of 5.96 yards per route run this week, picking up 155 yards from just 26 snaps in route. Six of his nine receptions resulted in a first down or touchdown, and he forced three missed tackles on the day. Howard’s impressive season continues, thanks to a performance that saw him average 2.89 yards per route run, the second-most among all tight ends with at least five targets this week. Over the past four weeks, Howard has seen 14 catchable targets and has caught all of them. Hill did what Hill does best and was a force throughout the game, averaging 4.06 yards per route run. From 53 snaps in route, the second most among wide receivers this week, he racked up a whopping 215 receiving yards, with 150 of those coming on throws 20-plus yards downfield. The Chiefs dropped back to pass a whopping 57 times on Monday Night Football, with Fisher allowing just three hurries on the night. Coupled with some solid work as a run blocker, that was enough to see him earn his spot here. Turner already had four starts at right tackle to his name this season, but kicking inside to left guard saw him produce his best performance of the year so far. He allowed just one hurry from 36 pass-blocking snaps and saw a lot of success as a run blocker. 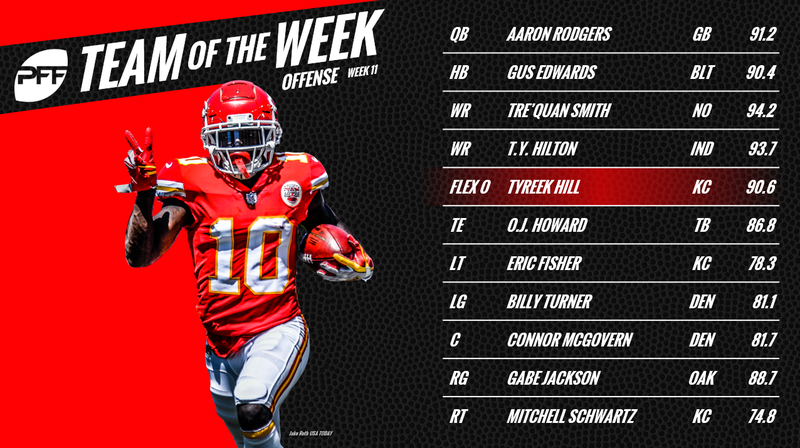 The second Denver Broncos offensive lineman on the PFF Team of the Week also makes the team in a week where he played an unfamiliar position. In his second start at center, the former Missouri Tiger didn’t allow a single sack, hit or hurry from 36 pass-blocking snaps. Jackson has struggled for much of the year so far but was utterly dominant for stretches of the win over the Cardinals. He produced an 83.0 run-blocking grade, and a 100.0 pass blocking efficiency rating with zero pressures allowed from 35 pass-blocking snaps. Completing the Chiefs 1-2 at offensive tackle this week, Schwartz had another big night on the right side of the line. From 57 pass-blocking snaps, he allowed just two hurries on the night. A star-studded edge defender duo kicks off with Khalil Mack, who was a monster against the Vikings, particularly against the run. He finished the game with a sack, hit and three hurries from 47 pass-rushing snaps, two total tackles resulting in a defensive stop and a forced fumble. It says all you need to know about Aaron Donald that even on a night where the final score was 54-51, he still stood out as dominant. From 54 pass-rushing opportunities, he racked up two sacks, eight hurries and two forced fumbles. While he was outperformed by Donald, Jones produced a pretty incredible night in his own right too. From 42 pass-rushing snaps, he racked up two sacks, two hits and three hurries, adding another two tackles resulting in a defensive stop against the run. Miller produced just a sack and two hurries from 40 pass-rushing snaps, but still found a way to have a game-changing impact thanks to one of the plays of the day. He read the screen by the Chargers brilliantly, cut off his rush and picked off the pass to give the Broncos excellent field position. Mosley has had a pretty disappointing 2018 season so far but delivered his best performance of the year in the win over the Bengals. Targeted six times in coverage, he allowed three receptions for just 26 yards and came away with a pass breakup. Scarlett saw just 34 snaps in the Texans win over the Redkins but delivered in a big way in coverage. Targeted three times, he allowed one reception for just six yards, and had an interception and pass breakup. The Steelers went after Ramsey in a big way, targeting him 14 times on the day. 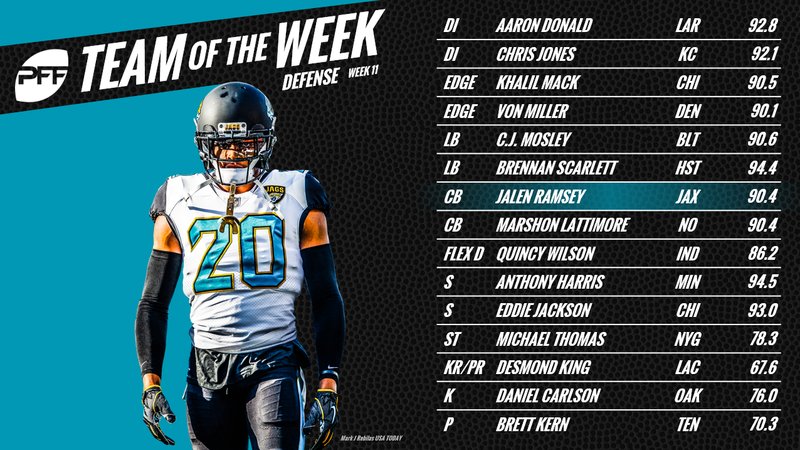 It did finally pay off and result in a big play, but Ramsey was making plays on his own too, coming away with two highlight-reel interceptions and a pass breakup. Lattimore hadn’t quite lived up to the reputation he had earned from his ridiculous rookie season but was very much back at that level in the win over the Eagles. Targeted four times in coverage, he allowed just two receptions for eight yards, coming away with a pass breakup and interception. By the end of the game, he had allowed an NFL passer rating of just 16.7 on throws into his coverage. Harris had a tremendous night in coverage for the Vikings, allowing zero receptions on plays where he was the primary coverage defender and coming away with two interceptions and a pass breakup to leave his mark on the Bears passing game. Jackson couldn’t match Harris’ two interceptions, but he did go one better than his Sunday Night Football opponent in returning the blocking he did have for a touchdown that wound up being the difference between the two teams when the clock hit zero. Wilson was targeted three times by the Titans quarterbacks, but surrendered just two receptions for 24 yards, and came away with an interception. It was just his second start of the season, but the highest graded game of the year for the 2017 second-round draft pick out of Florida. Carlson connected on field goals of 49 and 21 yards, before hitting the game-winner from 35 yards out for the Raiders. Cut by the Vikings after a three-miss performance against the Packers, Carlson has connected on six of seven field goals since joining the Raiders. A rough day for the Titans offense, but a good day for punter Brett Kern. Of his six punts, three landed inside the Indianapolis 20-yard line, and he averaged 49.3 yards per punt on the day. It’s been a quiet week for returners so far, but King has been the best of the bunch, averaging 23.3 yards per return from three kick returns, and forcing a missed tackle. Thomas delivered a fantastic special teams performance, seeing 23 snaps across the kick return, kick coverage, punt return, punt coverage and field goal block units. Thomas finished the game with an onside kick recovery and four special teams tackles.